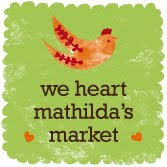 Another day of cramming before the market tomorrow. The day started pretty much the same way that it ended late last night – lots of work! 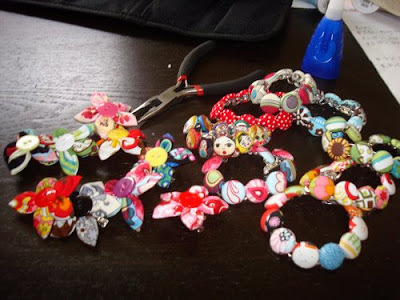 Last night was all about cutting and this morning was all about finishing bracelets and hairclips, as well as sewing. 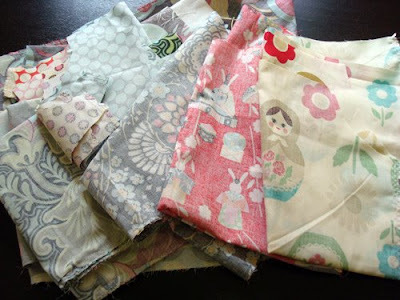 I usually sew when our children have gone to bed so it’s hard to get anything done during the day on a Saturday, as they want to do things! Fun things, crazy things, interesting things etc. I am not sure how interesting I am today but I did take my daughter to her Jazz dance and here you can see her practicing in front of her mirror. Yes, if you did pick up on it, her bed is too small for her. We have been trying to get it together and get her a single bed but that has not happened as yet. I have been eyeing this bed from Ivy’s room but what I really want is Ivy’s bookshelf! How adorable is it? 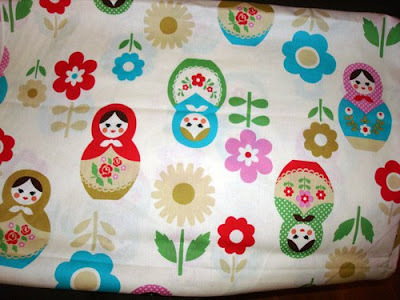 My newest Matryoshka/Babushka/Russian doll fabric from Kokka arrived yesterday, it’s just so cute. Hopefully I will have a cute dress to show you tonight. It will also end up in my shop. Check it out in the next day or so and if you want one, be quick, the last batch flew of the shelves! Thanks for sharing your new fabric. I agree, I think it will be a big seller. You know I love the bracelets though!!! Hej Jennie. Fick du något regn på dig idag? Gick det bra? Gud vad du är duktig som jobbar och sliter, men ni glömmer väl inte bort varandra du och gubben (-: Äsch, ni får ta igen det längre fram. Säg till om ni vill ha barnvakt om ni vill hitta på något kul. Nehej, nu börjar Biggest looser snart, spelar in det.